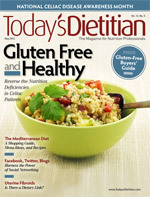 The only known effective treatment for celiac disease is eliminating dietary gluten.5 Therefore, dietitians are central to patient care at all stages of the disease—identification and diagnosis, reversing nutrient deficiencies, healing the small intestine and other affected organs, and helping patients adhere to a gluten-free diet. This article will discuss the signs and symptoms of celiac disease as well as common celiac disease-related nutrient deficiencies. Dietitians will learn more about the gluten-free diet and become better acquainted with the foods that promote intestinal healing. Dietetic expertise is key to the team care model for treating celiac disease patients. Celiac disease symptoms can vary widely between patients since factors such as age, gender, and disease duration impact disease manifestation. Detection also can be complicated by an absence of outward symptoms. Typically, adult and adolescent sufferers present with chronic diarrhea or constipation; pale, foul-smelling, or fatty stools; abdominal pain; gas; vomiting; weakness; and weight gain or loss. Gluten sensitivity, usually reported as diarrhea or other types of gastrointestinal discomfort after eating gluten-containing foods, is considered to be a subset of gluten intolerance. Celiac disease also is considered a subset of gluten intolerance. Adults are more likely than children to present with additional symptoms resulting from nutrient deficiencies and diarrhea since the disease has had more time to progress to the proximal and distal sections of the small intestine. As summarized in an article by Mary Niewinski, MS, RD, published in the April 2008 issue of the Journal of the American Dietetic Association (now the Journal of the Academy of Nutrition and Dietetics), these additional symptoms may include unexplained anemia, folate or zinc deficiency, low bone mineral density, dyspepsia, bone or joint pain, tooth discoloration, oral ulcers, arthritis, fatigue, menstrual irregularities, fertility problems or miscarriage, depression, anxiety, numbness or tingling in the hands and feet, or dermatitis herpetiformis (a chronic itchy, blistering skin rash). The National Foundation for Celiac Awareness reports that 95% of people with celiac disease aren’t aware they have it. This statistic is due in large part to under- and misdiagnosis and not because individuals fail to seek medical care. In fact, many patients experience multiple misdiagnoses before their antibody levels are high enough for the disease to be detected and for their physician to order a biopsy to confirm the presence of the disease. As indicated by Green and colleagues in 2005 in the Best Practices of Research on Clinical Gastroenterology, serological testing for celiac disease isn’t 100% sensitive. Even the gold standard test for celiac-specific immunoglobulin A antiendomysial antibodies and antitissue transglutaminase antibodies isn’t always accurate. The test often misses subclinical levels of antibodies, and children under the age of 2 don’t produce these antibodies. Therefore, for patients whose symptoms continue, despite negative blood tests, celiac disease can’t be ruled out without an intestinal biopsy, which involves the risks of an invasive procedure. This means that by the time dietitians see a patient diagnosed with celiac disease, he or she has undergone considerable intestinal damage, suffered multiple symptoms, and experienced painful procedures. Such patients require swift coaching and treatment. Research shows, however, that quick, strict adoption of the gluten-free diet brings considerable benefits. Dietitians can initially assist patients by listening to and understanding patients’ emotions and difficulties. They also can communicate the documented short- and long-term benefits of dietary compliance and reinforce the health consequences of noncompliance. They then can focus on helping patients make a smooth transition to the gluten-free diet and monitor them for nutrient deficiencies caused by dietary noncompliance or adherence to a nutrient-poor gluten-free diet. In the latter cases, dietitians must help clients boost nutrition by suggesting ways to increase the intake of pertinent nutrients. Because gluten-free products aren’t subject to the same fortification standards as conventional foods, even a healthful gluten-free diet can contain suboptimal levels of iron, folate, thiamin, riboflavin, niacin, and fiber. Dietitians can help patients by recommending fortified or enriched gluten-free brands and foods naturally gluten free and fiber rich. Supplements also may be necessary to correct nutrient deficiencies, but they must be gluten free or water miscible. The following is a discussion of several nutrients in which people with celiac disease may experience a deficiency because of the malabsorption that may result from intestinal damage. Halfdanarson and colleagues reported in the January 2007 edition of Blood that iron-deficiency anemia can be detected in 46% of subclinical celiac disease cases, with the higher prevalence in adults rather than children. Vitamin B12 deficiency is reported in untreated celiac disease patients at rates of 8% to 41%. Folate deficiency is common as well since damage often occurs in the jejunum, the center section of the small intestine, where folate is absorbed. Several foods contain both iron and vitamin B12 and are important for red blood cell formation and the resolution of neurological symptoms, such as peripheral neuropathy and numbness. Heme iron-rich foods such as beef, poultry, fish, and seafood are sources of vitamin B12 and easily absorbed iron. Non-heme iron foods, including beans, tofu, spinach, and molasses, provide less absorbable but important iron. B12 is found in additional sources such as eggs, milk, yogurt, cheese, and fortified grains. Folate is particularly important for women of childbearing age and can be found in green leafy vegetables such as spinach, enriched rice (naturally gluten free), and in some types of beans and lentils (also rich in iron). Folate also can be found in orange juice, which contains vitamin C that boosts iron absorption. Again, fortified gluten-free grains are a good source of folate as well as other valuable micronutrients. Calcium and vitamin D are necessary for healthy bone mineralization and the prevention of osteopenia or osteoporosis in celiac disease patients. Milk and dairy products, which are normally gluten free, provide a convenient source of both calcium and vitamin D. However, for patients who experience lactose intolerance as a secondary symptom of celiac disease, lactose-free, soy-based, or fermented dairy products may be more favorable. Calcium can be found in whole foods that supply a bevy of important nutrients. Some of these foods include green leafy vegetables such as spinach, collards, and kale; gluten-free grains including quinoa and brown rice; fortified orange juice; calcium-rich soy products; sea vegetables; beans; dried fruits; and blackstrap molasses. Unlike the bounty of calcium-rich foods available, there are limited food sources of vitamin D. It can be found in fish such as salmon, nuts, avocado, plant oils such as olive oil, and fortified eggs. Enriched eggs may be a wise choice for celiac patients because they also contain omega-3 fatty acids, which, according to preliminary research, may help decrease intestinal inflammation in these patients. For those who have trouble getting enough calcium and vitamin D, supplementation may be a good solution. However, vitamin D helps increase calcium absorption, thus eating food sources of each simultaneously can help patients maximize their intake of both micronutrients. The fatigue celiac disease patients experience may be due in part to a magnesium deficiency since this micronutrient aids in the body’s energy production and transport. Good magnesium sources include leafy green vegetables, bananas, dried apricots, avocados, peas, beans, soy products, and gluten-free whole grains such as brown rice and millet. Phosphorus also is important for energy storage and usage, vitamin and mineral usage, and the growth and repair of cells and tissues. Eighty-five percent of the body’s phosphorus is found in bones and teeth, and since celiac disease can weaken these, phosphorus must join calcium as a priority nutrient for patients with this condition. Foods supplying phosphorus include meat, poultry, fish, eggs, dairy products, nuts, and legumes as well as whole grains, potatoes, dried fruit, and garlic. Research on recommended levels of these nutrients for the celiac disease patient is inconclusive as is evidence concerning the value of supplements in addition to dietary sources. Fat-soluble vitamins E and K are important for repairing the cellular damage that occurs with celiac disease and also can be found in leafy green vegetables. Vitamin E, a disease-fighting antioxidant, can be found in gluten-free whole grains, wheat germ, vegetable oils, nuts, and seeds, while vitamin K, important for proper blood clotting function, can be found in dairy products, broccoli, and soybean oil. Because gluten-free grains, especially when fortified, can supply valuable nutrients, dietitians can assist patients by recommending the most nutritious gluten-free grains available. Grains are an important source of fiber, which celiac disease patients often underconsume. Many gluten-free grains aren’t fiber enriched, but if they’re whole grains, they may contain considerable levels of fiber. The National Foundation for Celiac Awareness lists the following alternatives as gluten free: almond meal flour, amaranth, rice (brown, white, and wild), buckwheat, coconut flour, corn, cornstarch, guar gum, millet, pea flour, potato flour, potatoes, quinoa, sorghum, soy flour, and teff. According to the Whole Grains Council, amaranth, millet, buckwheat, and wild rice are especially high in fiber. As highlighted by the previously mentioned article by Raymond and colleagues, quinoa stands out as a gluten-free grain abundant in micronutrients that are important for celiac disease patients (iron, calcium, magnesium, B vitamins, and fiber). Quinoa also is a more complete protein than other gluten-free grains since it’s high in lysine. Oats remain a controversial food in the celiac disease world. Many sources report that when oats are specifically processed to be 100% gluten free, they don’t seem to cause intestinal damage in celiac disease patients. However, other studies suggest that many commercial oat products are contaminated with gluten and that many individuals don’t seem to respond well to oats. Some celiac disease support organizations have added oats to their list of gluten-free or safe foods, while others have not. The safest way for those with celiac disease to live healthfully is to eat naturally gluten-free whole foods. However, since there are gluten-free specialty products available to enhance the gluten-free diet, celiac patients must carefully study labels for information on gluten content. Currently, shopping for commercial gluten-free products is less difficult than in the past but still risky for those particularly sensitive to gluten because many foods aren’t labeled accurately or consistently. • A product may be labeled gluten free only if it’s at or below the defined threshold of 20 ppm, a number that’s generally accepted by experts as safe for those with celiac disease. • Products that are inherently free of gluten (eg, nongrain products) will be in violation of the law if they’re labeled gluten free. • The labeling will be voluntary. • The lack of a statement on gluten doesn’t mean there’s no gluten in the product. The Gluten Intolerance Group, a US advocacy organization, developed a voluntary labeling program for manufacturers interested in accurately identifying their gluten-free products. The program gives a Gluten-Free Certification mark to products that contain 10 ppm or fewer of gluten. Canada reports that its regulations require gluten-free products to contain zero gluten, but the Canadian government uses 20 ppm as a limit when it tests products for label qualifications. Europe also allows the use of the gluten-free label on foods containing amounts of gluten below 20 ppm since January 1, 2012. Currently, celiac disease patients encounter obstacles to eating a gluten-free diet when eating out. Not only do few restaurants provide information on gluten, but gluten is found in many sauces, gravies, croutons, fillers, and other products that may be included in basic dishes although not taken into account for labeling purposes. Thus, many groups wish to see better gluten status labeling of all foods. In recent years, preliminary evidence has been published on the positive effects of various anti-inflammatory foods on the health of celiac disease patients. Because celiac symptoms overlap with those of other gastrointestinal conditions, such as leaky gut syndrome, foods that show promise for alleviating such disorders also may help celiac patients. Some of the nutrients and benefits being studied include probiotics and omega-3 fatty acids for reducing inflammation, alkaline fruits and vegetables for reducing gastrointestinal acidity, and glutamine and zinc for strengthening the gut lining. As summarized by Schuppan and colleagues in the December 2009 issue of Gastroenterology, scientists hope to explore the genetic modification of grains to alter their gluten contents, the addition of certain lactobacilli to bread to reduce immunotoxicity, oral enzyme therapies, neutralizing gluten antibodies, and intraluminal binding of gluten peptides. Because food is at the center of not only reversing the past damage to the intestine but also preventing future damage, dietitians can promote health and healing to patients through their support and guidance. As the number of diagnosed patients from diverse populations continues to rise, so does the demand for nutrition professionals with the skills, knowledge, and cultural competence to work with those facing the challenges of this complex, multisystemic disease. — Christen Cupples Cooper, MS, RD, is founder of Cooper Nutrition Education & Communications in Pleasantville, New York. She advises schools, businesses, and nonprofit organizations in nutrition and nutrition education services and teaches online courses on school nutrition. 1. Fasano A, Catassi C. Current approaches to diagnosis and treatment of celiac disease: an evolving spectrum. Gastroenterology. 2001;120(3):636-651. 2. Vader LW, Stepniak DT, Bunnik EM, et al. Characterization of cereal toxicity for celiac disease patients based on protein homology in grains. Gastroenterology. 2003;125(4):1105-1113. 3. Green PH, Jabri B. Coeliac disease. Lancet. 2003;362(9381):383-391. 4. Fasano A, Berti I, Gerarduzzi T, et al. Prevalence of celiac disease in at-risk and non-at-risk groups in the United States: a large multicenter study. Arch Intern Med. 2003;163(3):286-292. 5. Hill ID, Dirks MH, Liptak GS, et al. Guideline for the diagnosis and treatment of celiac disease in children: recommendations of the North American Society for Pediatric Gastroenterology, Hepatology and Nutrition. J Pediatr Gastroenterol Nutr. 2005;40(1):1-19. 6. Pietzak MM. Follow-up of patients with celiac disease: achieving compliance with treatment. Gastroenterology. 2005;128(4 suppl 1):S135-S141. 7. Stargrove MB, Treasure J, McKee DL. Herb, Nutrient, and Drug Interactions: Clinical Implications and Therapeutic Strategies. Philadelphia, PA: Mosby; 2008.